On, March 20th, representatives from over 10 organizations convened for the fourth working session to further strategize about a regional approach to tackling the acquisition of digital skills. We began the session by discussing the region’s Prosperity Strategy Executive Summary. The executive committee leading this effort is comprised of Greater Sacramento Economic Council, Sacramento Area Council of Governments, Sacramento Metro Chamber, and Valley Vision. Access and Competency of Use (Technical Skills): Acquire tech and computing resources and the competency to use them. Asset Map: Develop a database of assets for addressing digital literacy, including basic device training; internet and computer use; loaned equipment etc. 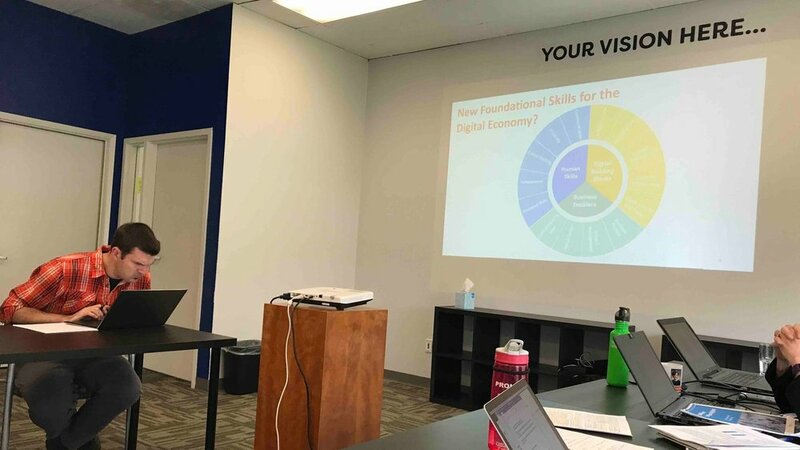 After discussing these items in depth we discussed The New Foundational Skills of the Digital Economy as it relates to this initiative. We identified the intersection between human skills, digital building block skills, and business enabler skills and the role these skills play in building the foundation for the digital economy.